Sometimes sports can be therapeutic as well as competitive. That was at least part of the atmosphere on display Thursday night at Hampden Academy, where Class AA Bangor scored a 64-50 boys basketball victory over the Class A Broncos in a battle of neighboring rivals who are positioned at or near the top of their respective divisions. While both teams were playing for the valuable Heal Points available, the game also provided an escape of sorts for both teams after a tragedy befell a friend — and a past or present teammate — of players on both squads. Marc Hutchings, a Hampden Academy senior from Glenburn and the starting center for the Broncos’ boys basketball team this winter, suffered multiple injuries early Wednesday morning when the pickup truck he was driving went off outer Essex Street in Bangor and brought down a utility pole. At the time of his accident, about 3 a.m., Hutchings had been sent out to do sanding work by the property management company he works for, according to Hampden boys basketball head coach Russ Bartlett. Hutchings’ truck slid on ice, hit the pole near the intersection of Essex Street and Fox Hollow, and overturned, according to a report. Hutchings remains at Northern Light Eastern Maine Medical Center in Bangor, and a lengthy recuperative process is anticipated. 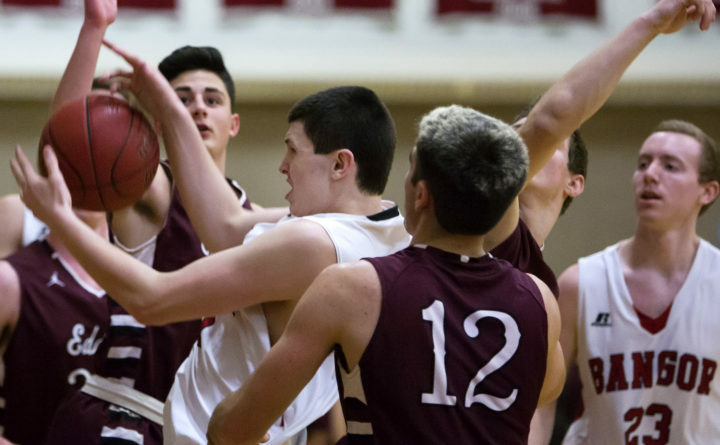 The 6-foot-5-inch Hutchings spent his first two years of high school at Bangor before transferring to Hampden as a junior in the fall of 2017. He has played varsity basketball at both schools. Among the Hampden players who visited Hutchings in the hospital Wednesday was junior guard Bryce Lausier. He also played middle-school basketball with Hutchings before they reunited last winter at Hampden Academy. “I’ve known Marc since sixth grade because we went to middle school together, and we were good friends through middle school and then he went to Bangor and I went to Hampden,” said Lausier, who scored a game-high 23 points in Thursday’s game. “When I found out he was transferring to Hampden I was super happy to have another guy from Glenburn here to relate to. He gave me rides home and we’re good pals so I was really sad to hear about what happened. Friends and family received even better news Thursday, as Hutchings was allowed to sit up in his hospital bed and eat solid food. His chosen cuisine for the day reportedly was three milk shakes and an order of bacon. On Thursday, hospital staff had him up on his feet. The Hampden players hung Hutchings’ No. 34 basketball jersey in their locker room before Thursday’s showdown against Bangor, the top-ranked team in Class AA North, and took it out to the bench with them for the game. A moment of silence in support of Hutchings preceded the start of the game. Bangor took the lead midway through the second quarter and gradually pulled away for a hard-fought victory that improved its record to 9-1. Hampden, the defending Class A North champion, fell to 7-2 but remains ranked third in the division. Bartlett was impressed not only with how his players battled a strong opponent, but also how they have coped with their teammate’s misfortune.